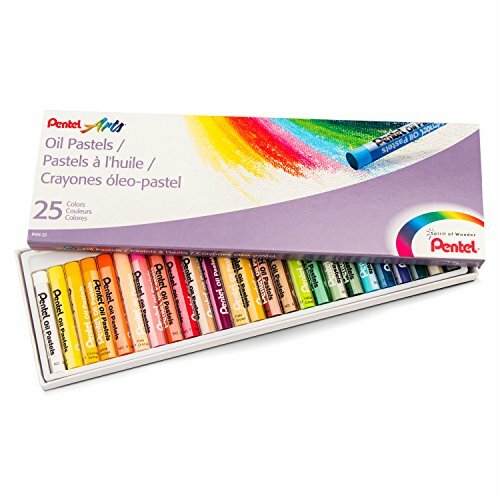 The Pentel Arts Oil Pastels provide more vibrant color than chalk pastels - oil pastels make your artwork come to life. Rich, fade-resistant color applies smoothly and blends easily to produce subtle shades and tints. Best for use on board, paper and canvas. Acid-free pastels are resistant to the effects of humidity for longer lasting drawings. Includes a carrying case. Certified AP non-toxic. Warranty: Each Pentel product is warranted for life against failure due to defects in materials and workmanship. For warranty service, return product for free repair or replacement: Pentel of America, Ltd., 2715 Columbia Street, Torrance, CA 90503, U.S.A., Attn: Quality Assurance Department. Easy to draw with a smooth touch. The craypas family is ideally suited to compliment technique and expression development from childhood through high school, college, and into the professional level. Extremely smooth to apply, high school students, hobbyists and artists can express their spirit with broad strokes, blending colors, to build texture and depth. From dramatic to muted, flamboyant to quiet, the color range allows users to convey any inspired feeling or imaginative image. Expressionist extender assists in the creation of color hues that further extends the visual possibilities of the final art form. Extra fine quality pigment formulation. Meets nontoxicity requirements. Suitable for many surfaces paper, cardboard, canvas and wood. Applicable for portraits, landscapes and still lifes, handmade cards, scrapbook projects, scratch art, wall art and stenciling. Technical qualities are 48 bright and vivid colors, extra fine quality pigment formulations, extremely smooth application, 10mm diameter by 71mm length round stick, ap seal certified for nontoxicity. 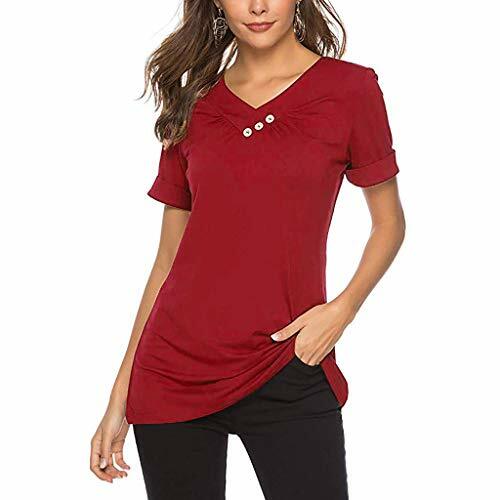 Set includes 50 assorted colors. 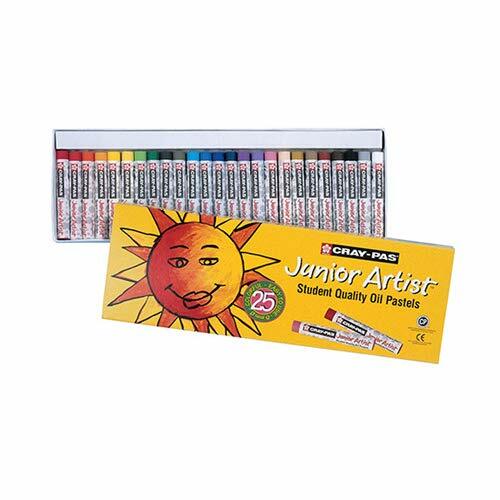 Craypas junior artist assorted color oil pastel set. Craypas family is ideally suited to compliment technique and expression development from childhood through high school, college, and into the professional level. Young artists blossom with creamy, smooth color that they can smear, blend, dot, overlap and mix. They can learn how to hold a stick to achieve different strokes either as a pencil, clenched in a fist or on its side. Scratch and stencil art are possible in addition to working with water color over variety. Creativity and interest are enhanced with materials that encourage exploration and expression. Meets astm and acmi nontoxicity standard ap seal. No use of treenut oils, soy, latex, wheat, oat, barley, animal oils or waxes, dairy, casein, or egg ingredients. Will not peel, crack or flake, and are easily blendable. Oil paint effects, overlaying color, and a variety of effects can be experienced. Applicable for creative drawing, lettering and signage, scratch art and dot art, wall art and stenciling art, cards and craft projects. Technical qualities are capable of creating oil paint effects, easy to blend and consistent color hue within sets for nontoxicity, not recommended for use on fabrics intended to be washed, on food service or ceramics that are washed, and not evaluated for cosmetic use on skin. Pastel set 12color assortment includes black, white, cobalt blue, red, orange, yellow, yellowgreen, pink, purple, green, pale orange and brown. Comes with 50 sticks per pack. 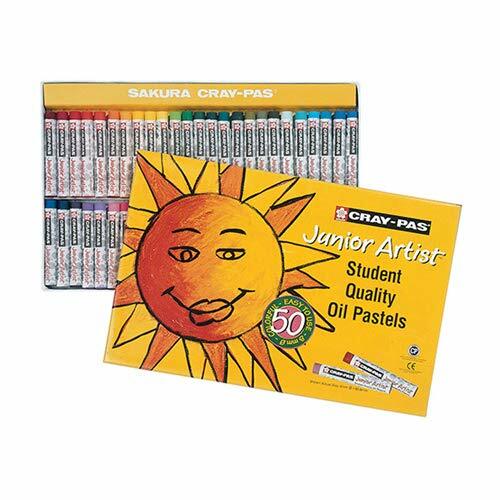 Craypas junior artist assorted color oil pastel set. Craypas family is ideally suited to compliment technique and expression development from childhood through high school, college, and into the professional level. Young artists blossom with creamy, smooth color that they can smear, blend, dot, overlap and mix. They can learn how to hold a stick to achieve different strokes either as a pencil, clenched in a fist or on its side. Scratch and stencil art are possible in addition to working with water color over variety. Creativity and interest are enhanced with materials that encourage exploration and expression. Meets astm and acmi nontoxicity standard ap seal. No use of treenut oils, soy, latex, wheat, oat, barley, animal oils or waxes, dairy, casein, or egg ingredients. Will not peel, crack or flake, and are easily blendable. Oil paint effects, overlaying color, and a variety of effects can be experienced. Applicable for creative drawing, lettering and signage, scratch art and dot art, wall art and stenciling art, cards and craft projects. Technical qualities are capable of creating oil paint effects, easy to blend and consistent color hue within sets for nontoxicity, not recommended for use on fabrics intended to be washed, on food service or ceramics that are washed, and not evaluated for cosmetic use on skin. 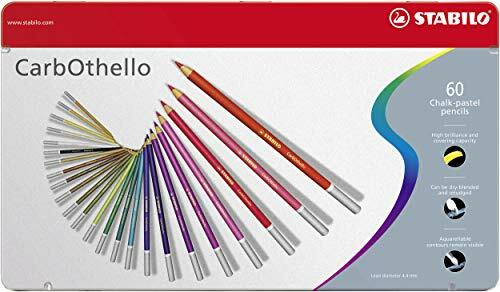 Pastel set 12color assortment includes black, white, cobalt blue, red, orange, yellow, yellowgreen, pink, purple, green, pale orange and brown. Comes with 25 sticks per pack. 10 Piece Set. These ever-popular double-headed, flexible nylon fiber brush pens have a single ink reservoir and two tips one brush tip and one fine tip. The water-based ink is acid-free, non-toxic and blendable, allowing an endless palette of colors. The convenience of a flexible brush and a fine tip in one pen. High-quality, resilient brush retains its point stroke after stroke. Non-toxic, acid-free, odor-less and nonbleed water-based ink blends easily. Create subtle color washes by dipping brush tip in water. Blend colors easily with the Dual Brush Blender Pen. Ideal for fine arts and crafts. 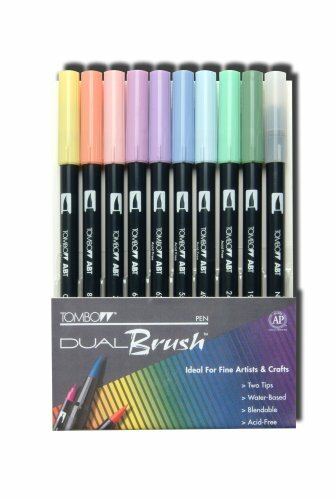 Includes: Pastel colors (9pc) and a Dual Brush Blender Pen. 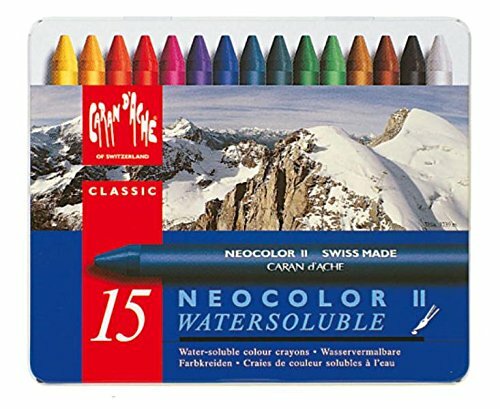 Add luminous color to your artwork with this 15-piece assortment of Neocolor II Water-soluble Artists' Pastels from Caran d'Ache. 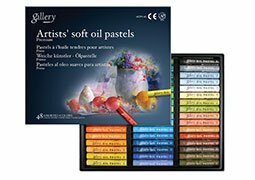 These superior-quality artists' pastels meet the exacting requirements of fine artists, illustrators, graphic artists and teachers. 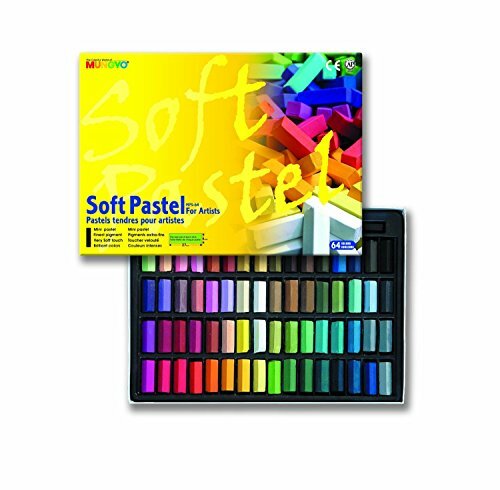 Use these soft, water-soluble pastels to create beautiful watercolor effects. Simply make a sketch with Neocolor II pastels, then sprinkle it with water and allow the colors to dilute. Use a brush to pick up colors and paint as though with watercolors. You can also draw on moistened paper for a wash and varnish effect. 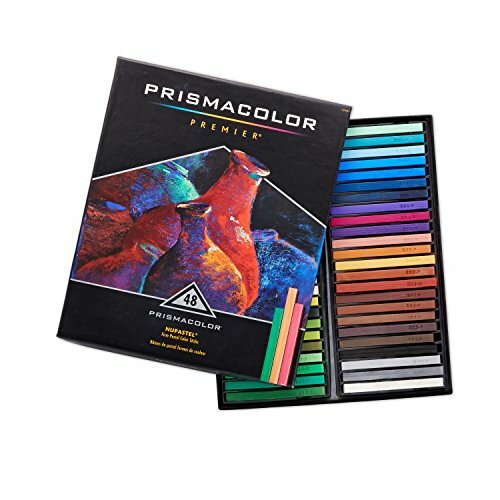 Neocolor II Artists' Pastels have a high pigment concentration that results in bright, opaque colors, suitable for many techniques on dry or wet paper. Neocolor II water-soluble wax pastels are a product of Caran d'Ache innovation. They combine the expertise of a color specialist with the great ''Swiss Made'' tradition. Neocolor II wax pastels are exceptional, both for their quality and the techniques they make possible. Neocolor provides inspiration and opportunity for all professional and amateur artists to fully express their talent and imagination. Set is packaged in a metal tin. Conforms to EM-71 (CE) and ASTM D4236 safety standards, suitable use in for U.S. schools. Caran d'Ache products are ideal for sketching, figure drawing, and portraits. Caran d'Ache uses high-quality pigments for colorfastness and excellent lightfastness. For over 80 years, Caran d'Ache has inspired amateur and professional artists, providing top quality pastels, pencils, paints, brushes and more. 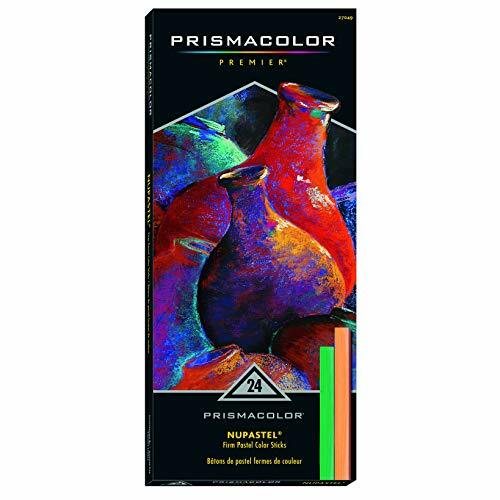 The intense pigmentation of these pastel pencils provides excellent performance on thin paper and strong color gradations in application. Light-proof, non-toxic, break-resistant, blendable and partially soluble (contours will remain visible). A fixative is recommended on finished pieces. 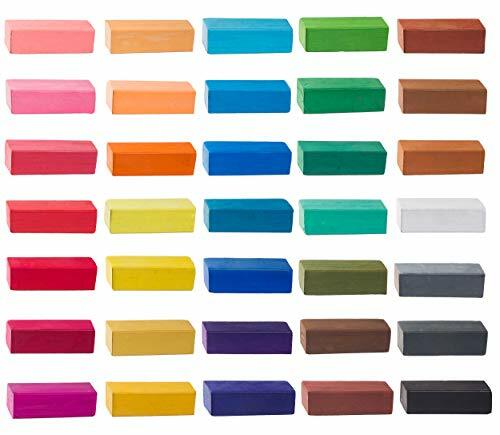 Add luminous color to your artwork with this 30-piece assortment of Neocolor II Water-soluble Artists' Pastels from Caran d'Ache. 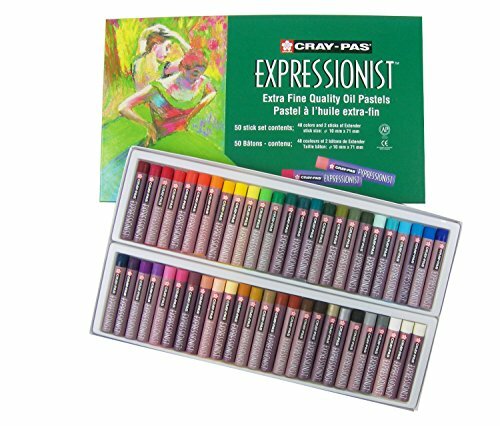 These superior-quality artists' pastels meet the exacting requirements of fine artists, illustrators, graphic artists and teachers. 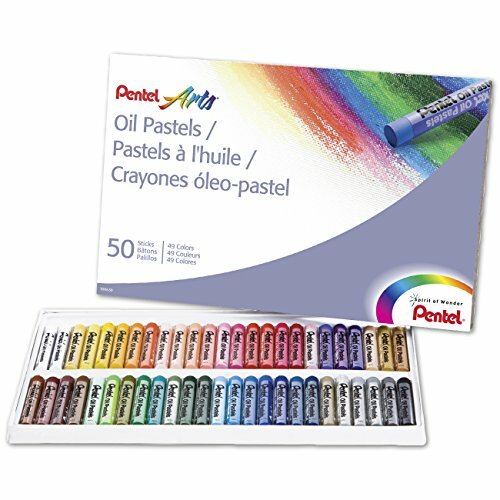 Use these soft, water-soluble pastels to create beautiful watercolor effects. Simply make a sketch with Neocolor II pastels, then sprinkle it with water and allow the colors to dilute. Use a brush to pick up colors and paint as though with watercolors. You can also draw on moistened paper for a wash and varnish effect. Neocolor II Artists' Pastels have a high pigment concentration that results in bright, opaque colors, suitable for many techniques on dry or wet paper. Neocolor II water-soluble wax pastels are a product of Caran d'Ache innovation. They combine the expertise of a color specialist with the great ''Swiss Made'' tradition. Neocolor II wax pastels are exceptional, both for their quality and the techniques they make possible. Neocolor provides inspiration and opportunity for all professional and amateur artists to fully express their talent and imagination. Set is packaged in a metal tin. Conforms to EM-71 (CE) and ASTM D4236 safety standards, suitable use in for U.S. schools. Caran d'Ache products are ideal for sketching, figure drawing, and portraits. Caran d'Ache uses high-quality pigments for colorfastness and excellent lightfastness. For over 80 years, Caran d'Ache has inspired amateur and professional artists, providing top quality pastels, pencils, paints, brushes and more. Vibrant Colors: 36 Vibrant and vivid colors that will make your dream artwork come through. 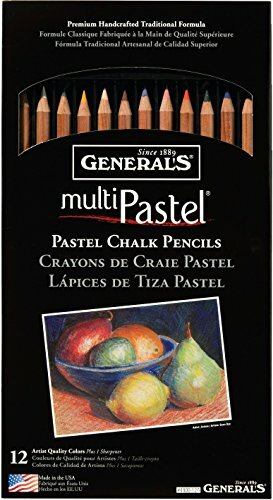 Different Techniques: This soft chalk pastel set is excellent for all types of blending, gradation, dry-wash, etc. Easy to Use: Easy to draw with a smooth touch, our soft pastels are fade-resistant and made from the finest materials. Excellent Gift: for New Year, Easter, Thanksgiving, Christmas, Birthday or Graduation, ideal for families, friends, kids, and adults. Love It Or Get a Full Refund: Your satisfaction is our number one priority and this is why we strive to provide you with only the best quality products and service every time. If for any reason you are not completely satisfied with our product, we will give you a full refund -no questions asked! Just let us know, we'll be happy to help you out! 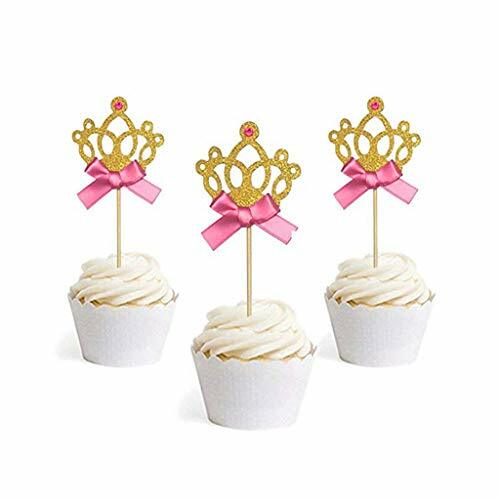 GREAT PARTY DECORATIONS: The crown cake toppers are ideal for wedding, birthday, baby shower, and Kids' party decorations. PERFECT FOOD PICKS: The cute cupcake toppers also can be used as cupcake picks, appetizer picks, fruit picks, or party food picks, etc. Perfect for wedding decorations, Thanksgiving, Christmas, Halloween, birthday party, bridal shower party. Do not put the cute cupcake toppers in oven, intended for decoration only. About the shipment,There are two ways : Standard shipping 15-20 days , Expedited shipping:3-7 days .And our product is good with reasonable price and we believe it will be worth having it, so please wait for it patiently! Package includes 24 pieces gold glitter crown cupcake crystal toppers; adequate amount to decorate your cupcakes in birthday or wedding party. DIY assembling cupcake toppers. It's easy to assemble and decorate your birthday party ceremony. Nice decor for your birthday cake, pie, fruit plate sweet table etc. Ideal for all parties, celebration, festival, ect. Suit for both birthday girl and boy.